The 508-member People's Assembly – Egypt's lower-house parliament – will meet for procedural matters Monday. It comes almost one year after the outbreak of the January 25 Revolution. The Assembly is scheduled to hold three meetings. The first will begin at 11 o'clock. According to parliamentary regulations, the oldest MP – the Wafdist and constitutional law expert Mahmoud El-Sakka – will chair two meetings. El-Sakka, 81 years old, will begin with reciting three decrees issued by Field Marshal Hussein Tantawi, head of the ruling Supreme Council of the Armed Forces (SCAF), inviting voters to participate in electing members to the People's Assembly and inviting the People's Assembly to meet 23 January. The third decree – issued by Tantawi on 21 January – concerns appointing 10 public figures in the People's Assembly. The reading of these decrees will be followed by the newly-elected MPs taking the constitutional oath. As many as 508 deputies will swear that they will respect the constitution, all laws, and serve the nation in an honest way. El-Sakka will be helped by the Assembly's two youngest members, Mohamed Talaat Mohamed Othman, 29 years old, who belongs to the Salafist Al-Nour Party, and Sherif Zahran, 30 years old, who is an appointed MP. El-Sakka is expected to ask MPs to observe one minute's silence as an expression of respect for the victims of the January 25 Revolution. Next comes the procedural issue of electing a new speaker for the People's Assembly. This post had been monopolised by ousted president Hosni Mubarak's defunct ruling National Democratic Party (NDP) since 1978. The NDP's Fathi Sorour, now in custody, had been speaker since 1990. Saad El-Katatni, secretary-general of the Freedom and Justice Party (FJP) – the political arm of Muslim Brotherhood – is expected to be the next and seventh speaker of the People's Assembly since the 1971 constitution. El-Katatni, 60, resigned as the FJP's secretary-general and is expected to gain the support of no less than 235 deputies. This is the sum total of 213 FJP deputies and 22 who belong to the Democratic Alliance, which joined the FJP on lists of party-based candidates. El-Katatni is also expected to gain the support of 121 deputies of the Salafist Nour Party. He will be the first Muslim Brotherhood member to hold such a high-ranking position since it was established by Hassan El-Banna in 1928. Another Islamist, Essam Sultan, a member of the moderate Islamist Al-Wasat Party, nominated himself for the post of speaker, but is not expected to gain many votes. Once elected, the second meeting will begin with the speaker launching the procedure of electing two deputies: one representing workers and farmers and the other representing professionals. A tacit agreement was reached among leading parliamentary forces aiming to leave the two posts to the two parties after the FJP that got the highest number of votes in the elections, the Salafist Al-Nour and the liberal Wafd parties. Al-Nour decided to nominate Ashraf Thabet, a member of the party's higher council and an MP for Alexandria, for the post of the professionals' deputy. For its part, the Wafd Party nominated Mohamed Abdel-Alim, a journalist and a long-time Wafdist, for the workers and farmers' deputy. A seven-member committee will supervise the election of the speaker and his two deputies. It will includes representatives from the major political parties and independents. The third session will begin with announcing the results of the election of the two deputies. SCAF chairman Field Marshal Mohamed Hussein Tantawi is not expected to attend the Assembly's procedural meetings. According to parliamentary protocol, the head of the republic only comes to attend the joint session of the two houses of parliament – the People's Assembly and Shura Council – to deliver an opening speech. It is the prime minister who usually comes to attend the procedural session in order to deliver word about cooperation between parliament and the government. Prime Minister Kamal El-Ganzouri, who was appointed 7 December, will explain his efforts at improving economic conditions and completing the revolution's objectives. Mohamed Attia, minister of local administration, said "El-Ganzouri is expected to speak about the victims of the revolution and how the government is committed to compensating their families financially." A large number of local, Arab and foreign guests are expected to attend the procedural meetings. The buildings of the two houses of parliament have been under the strict guard of armed forces and Central Security Forces since 28 January 2011 (the Friday of Rage). A contingent of around 2000 forces are there to keep parliament safe from subversive acts. Meanwhile, two metal gates were installed at the entrance of the street of the Cabinet and People's Assembly after protesters tried to enter parliament 17 December. All guests, media personnel and MPs are to enter the buildings from one gate (the gate in front of the Ministry of Health). Political forces are divided on what to do on Wednesday's first anniversary of the January 25 Revolution, with the Muslim Brotherhood announcing its rejection of using the anniversary to launch another revolution, this time against the SCAF. Meanwhile, the results of the three-stage parliamentary elections have been announced. The Muslim Brotherhood's FJP got 235 seats (47.2 per cent). This includes 22 deputies belonging to other political parties that joined the Democratic Alliance during the elections. The 235 number is the sum total of 127 won via the party list system and 108 won as independents. The second biggest party, the Nour Party, took 121 seats (96 via the lists system and 25 independents), or 24 per cent. This also includes MPs belonging to the Building and Reconstruction Party (Al-Jamaa Al-Islamiya). The latter also gained three seats as independents. Another Islamist party, Al-Wasat Party (an offshoot of the Muslim Brotherhood) won 10 seats, or 1.8 per cent. In sum, the total of Islamists 347, or almost two thirds of the Assembly's seats (508). 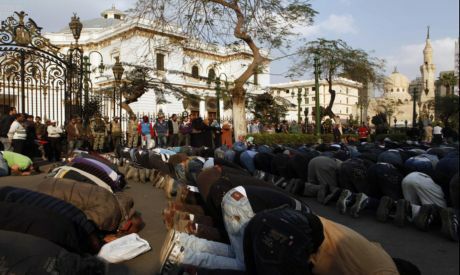 This overwhelming majority led some to call the coming Assembly "Egypt's first political Islamic parliament." Liberals, leftists and NDP's remnants occupy the remaining third. The liberals include Al-Wafd (38 deputies), the Egyptian Bloc (35), the Reform and Development Party led by Anwar Esmat El-Sadat, nephew of late President Anwar El-Sadat (10 seats), the Egypt Democratic Socialist Party (three individual seats), Al-Adl (Justice) Party, and the Civilisation Party (two seats). The NDP remnants include The Freedom Party (five), the National Party of Egypt (six), the Democratic Peace Party (one seat), the National Union Party (one seat) and the Union Party (one seat). The last force includes 28 independents, the most prominent of whom are liberal Al-Ahram researcher Amr Elchoubaki, journalist Mostafa Bakri, and leftist El-Badri Farghali. Isn't Amr Elchoubaki part of Al-Adl? And El-Badri Farghali part of the Tagammu, which in turn is part of the Egyptian Bloc? What about the revolution continues alliance?